Figure 7.37. 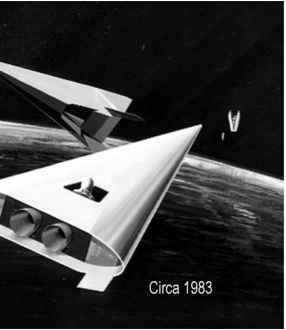 VASIMR technology development roadmap [ASPL, 2000]. Research on VASIMR is continuing at the laboratory scale. The group investigating VASIMR has left NASA and has formed an independent company based in the US and Costa Rica. Current experiments focus on power losses (including radiation), the ionization efficiency of the helicon antenna, and magnetic nozzle performance. Among the results, a plasma ion density of the order of 1020 cm~3 has been achieved at a neutral pressure of the order of 100 Pa (see [Negrotti, 2008]). In August 2008 Michael Griffin, current NASA Administrator, announced that a small VASIMR engine will be tested on the International Space Station, presumably for orbit raising. 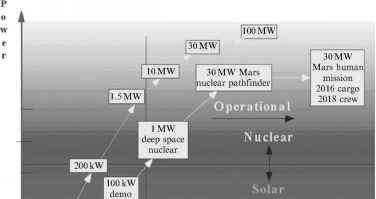 In any event, MPD propulsion will have to wait until a manned mission to Mars, or at least a "dry run'' precursor mission such as to an NEO, around 2015 [Claybaugh et al., 2004]. If MPD propulsion is chosen, and if all technical questions are answered, VASIMR will be the natural candidate propulsion system.